Such an influential miasma is the foodblogosphere. Just when I was all involved with one blogger's fig jam, along came another blogger's tomato chutney. As it happened, I was fresh off an experiment combining tomatoes and figs, and although that's not the happily-ever-after ending to today's story, it might explain how I wound up cooking a pot of fig chutney. One more thing. I'm wallowing in a glut of recently harvested wild fennel seeds, and... well, you know how seedy figs are? And then there was that photo of the aromatic seeds swimming around in the tomato chutney... And. So: Fig chutney. This is not a recipe (you know me better than that), this is just my notes. Wash and cut figs into sixths. Cut up some onion into little, but still identifiable, chunks. All right. Spoon a little honey into a saucepan. I used more than a little, because to me, figs taste like honey in a shell. Add a nice splash of wine to the honey (rosé happened to be on hand), and toss in the figs and onions. Warm it all up on low heat. Now, start tinkering with flavors. I threw in fennel seeds, mustard seeds and black onion seeds. A little salt. A little more salt. A crack of black pepper. More Spanish sherry vinegar than I would have thought. An hour or so later, if it's to your liking (and the whole house smells divine), turn off the flame and let it cool. This is not a heat-processed project; I'm still working up my courage for that. No, today, I just spooned the delicious goo into a clean jar and refrigerated it. I'm going to slather it over a deconstructed chicken-potato curry. Kind of an un-stew. "Recipe" might follow; might not. Something to do with my figs. I have to admit I don't like them as 'fruit' to be eaten out of hand - too sweet for me (I like a bit of 'tart') A chutney that can be spiced up is the perfect answer! Now, if the bees have left any for me...Interesting bit: the FDA dictates how many bug parts are allowable in a Fig Newton (so the internet tells me..) The next thing you crunch could be a bee skull.....sterilized, of course. figgy wit it...hee hee hee! sounds yummy!! Katie: How fabulous that you *have* figs. Yes, they are sweet. I might have used too much honey in my mix; hence all the vinegar. I love that you're backing me up on the insect parts info on figs; I'm trying to convince Dr. Biggles that figs are almost meat. Stacie: I'm running out of song ideas. Problem with getting older, I guess. funny - i just caught your getting figgy with it post - i have a wee chutney business and that is exactly what we have on our newest t-shirt! loved the post....keep up the good work. here's my link - www.mcquadechutneys.com - yours sounds delicious - we should do a swap! Alison: I'm coming over to look right now, but I just wanted to tell you we ate the chutney with a chicken-potato pseudo curry last night and it was OUTRAGEOUS. I don't even mind bragging about it to you, a professional. Alison: Me again. I KNOW WHO YOU ARE! I've drooled over your website in the past. Amazing. 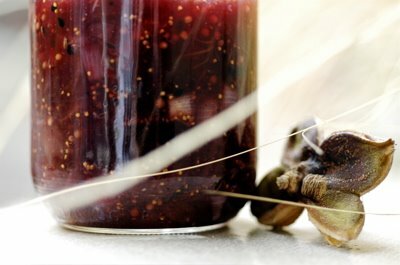 I really do wish I could offer you a taste of my crazy figgy jam, but I only made half a jar. Hubby liked it so much he's taking me fig shopping today, but I fear the season has slipped away. oh come one - you can scrounge some up from somewhere - i could have sworn i spotted some fresh figs at whole foods a couple of days ago - there you go - you've got a challenge!